Thanks to Dr. Jamie Shutter, East Carolina University Brody School of Medicine, North Carolina (USA), for contributing this case and part of the discussion. To contribute a Case of the Week, follow the guidelines on our Case of the Week page. We are now offering over 30 new products including antibodies for the following targets: Aldh1A1, CD30, LIN28, Myogenin, PAX5, and S100P. And antibody cocktails for the following target combinations: (CK5 & CK14), (CK5 & CK14 & p63), (CK5 & CK6 & ERG), (CK5 & ERG), (CK7 & CDX2), click here. Visit us at epitomics.com/diagnostics for our complete product listing. EP Clones are a line of high quality antibodies for anatomical pathology. Each antibody is generated using Epitomics' patented rabbit hybridoma technology offering superior binding affinity and specificity. (1) The Uterus chapter has now been updated, based on reviews by Mohamed Mokhtar Desouki, MD, PhD and Nat Pernick, M.D. (2) In February 2012, we again had record traffic, with 368,979 visits (8.8 million "hits"), and a record 12,723 visits per day. We are starting to post topics for a new Forensic Pathology chapter. (3) We have a Special offer thru 4/30/2012 for our Jobs page. Post a Pathologist/PhD Job ad for the regular price of $800, and receive one FREE posting for a Job-Other ad (normally $500), if sent to us within 2 business days. (4) We have added links for free CME from Cleveland Clinic to our CME / Apps for Pathology or Laboratory Medicine page, which has a link on the left side of the Home page. A 71 year old woman with invasive breast cancer underwent a mastectomy and sentinel lymph node excision. 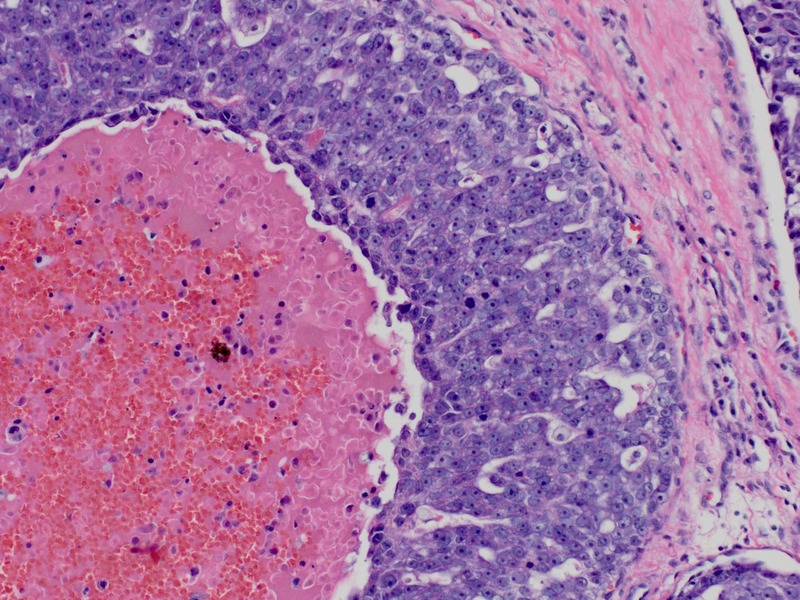 The microscopic images show large areas of atypical cells with central comedo-like necrosis that mimics DCIS. However, these are actually large foci of invasive cancer. 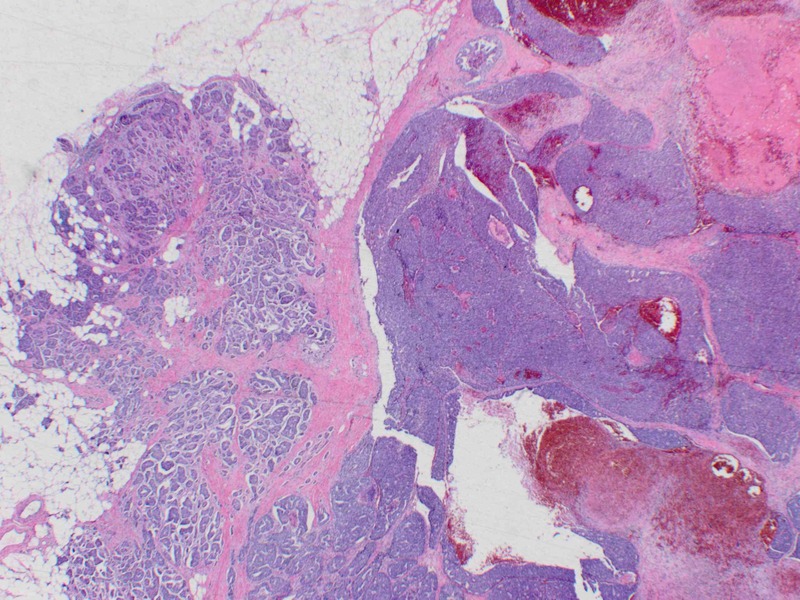 In some images, typical invasive carcinoma is present at the edge of the mass and within the lymph node. 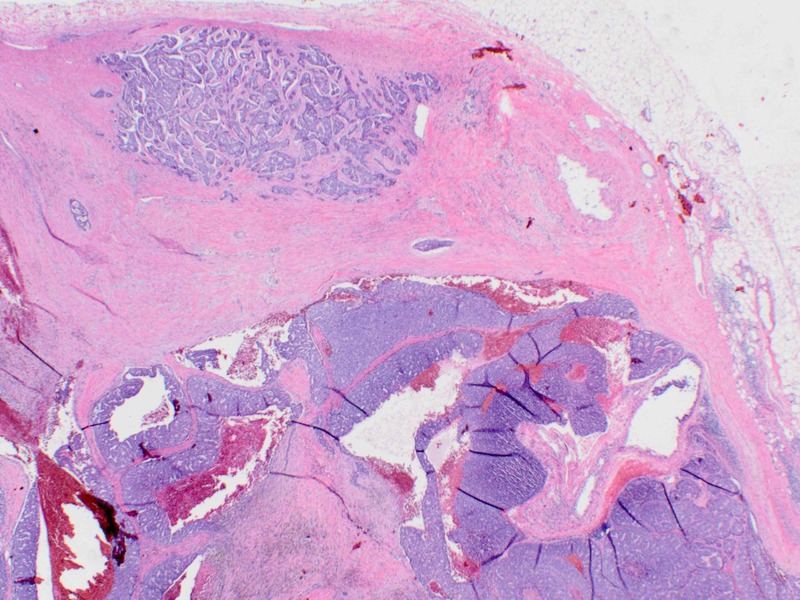 The lymph node was entirely replaced by tumor of the same morphology. These cases are difficult on biopsy because they resemble DCIS and the juxtaposed typical invasive tumor may not be present. 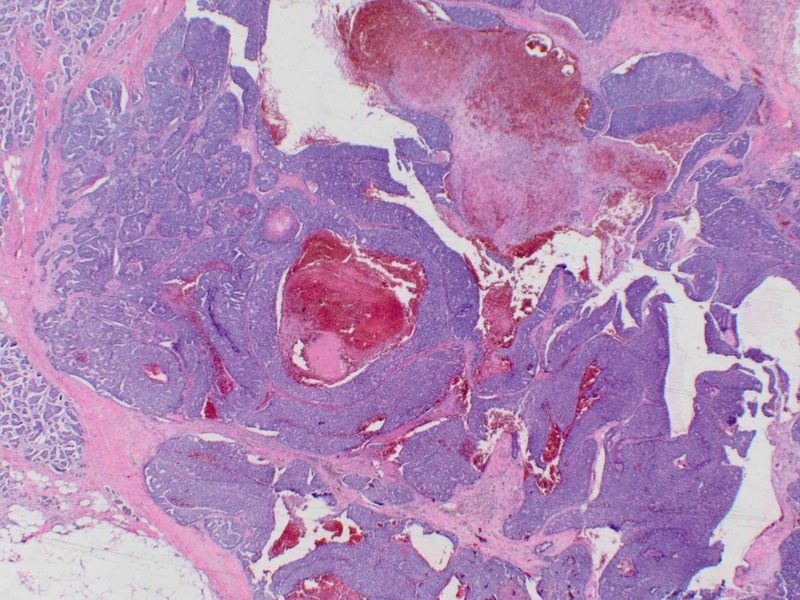 A key to the diagnosis is the presence of tumor of identical morphology in the lymph node. For determining tumor maximum dimension in T staging, it is important to include DCIS-appearing tumor as invasive carcinoma (J Med Case Reports 2007 Sep 8;1:83). 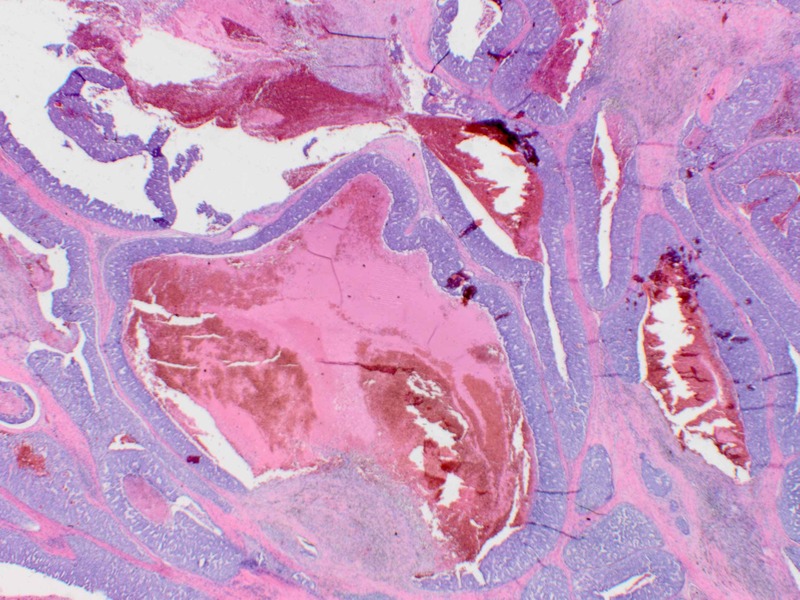 The differential diagnosis includes central acellular carcinoma, which has one large foci of central necrosis. As noted above, DCIS is also in the differential.